The New York Times called Jill an “expert” for summer. That’s because she takes the time to understand the personality and needs of each individual family and child — and tailors her recommendations accordingly. Her objective guidance helps you find the solution that’s just right. Jill Tipograph, CEO & founder of Everything Summer & Beyond, LLC, and co-founder of Early Stage Careers, LLC, is the nationally recognized youth expert and educational consultant who guides families worldwide through the summer planning and enrichment process (a 20+ year industry veteran). Everything Summer®, a boutique independent consultancy based in New York City that services clients nationally and around the world, aligns its clients’ interests and extracurricular activities to help students find their passions, designing the right summer and year-round experiences. The focus is finding the ‘right fit’ experience, recommending programs that will make a difference for each student. 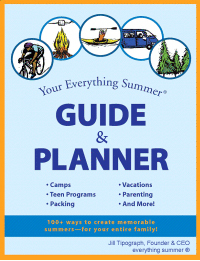 Everything Summer removes the stress and overwhelming nature of summer planning by helping teens with pre-college direction and transition, and college students with career planning. Jill understands that summers are pivotal in the development of teens in particular and they are a game-changer for college. So often this is where each student’s story is discovered and expanded. Jill is considered the ‘go to’ media resource for summer and youth, having been featured in The New York Times, Wall Street Journal, USA Today, Forbes, Business Week, Inc., Bloomberg, NBC’s Today Show, ABC and NBC News, CNBC, MSNBC, U.S. News & World Report and more. She also speaks on youth, teen and parenting topics at educational institutions, organizations, and corporations; including the American Camp Association and the National Association of Independent Schools. Jill is the author of Your Everything Summer® Guide & Planner, and co-author of the National Pre-College Summer Survey of College Admissions Officers. Prior to summer advising, Jill spent many years as a corporate executive, honing her skills in client service, research, analysis, marketing and planning. Jill’s two children have been campers, camp counselors, and participated in a variety of pre-college summer programs. As member of the American Camp Association (ACA), Jill has been involved in several of its pivotal committees to make a difference in the lives of children and teens: the Underage Drinking Prevention Program; a task force to research camp trends; and the Teen Leadership Conference. Jill is also an active board member of the non-profit organization SCOPE (Summer Camp Opportunities Promote Education). If you want real knowledge, you have to go to camp! Jill visits camps to and programs to get the inside scoop. Jill is the only dedicated Summer Planning Expert and Enrichment Consultant who is a professional member of the Independent Educational Consultants Association(IECA), as well as the National Association of College Admissions Counselors (NACAC). She is also on the advisory board of the Gap Year Association. Her in-depth knowledge of families, youth, summer programs, extracurricular activities and academic institutions gives her the skills she needs to aid teens in their academic pursuits. She has helped families understand what their teenagers should be looking for in a school, what institutions will be a good fit, and what those schools are looking for in an applicant. Her recommendations for summer experiences have given teens and college students the skills, confidence, and experience necessary for lifelong success.